We have awesome news concerning Le Gouffre on this beautiful beginning of summer. First of all, our film received a great welcome at the Palm Springs festival and won Second Place for the Audience Award. It was also chosen to be part of the Best of Fest program, which we are very proud of! The film was also selected in three new festivals. Don’t miss the chance to see Le Gouffre on a big screen if you’re in the area! And finally, here’s an interview we did for a Japanese website a couple of months ago that was just put online. Since a lot of you probably can’t read Japanese, we posted our original answers in English under the link. Why did you choose Kickstarter to fund your project? We didn’t plan on using Kickstarter (or any other crowdfunding platform) when we first started to work on our film. We took jobs, saved up money and then quit those jobs to do this project full time. Back then, we thought it would take only one year to do the whole film, but as we progressed we realized we needed another full year to push the quality of our movie as much as we wanted. We tried twice to get a government grant for our project but it didn’t work out. That’s when we realized we needed more money and decided to turn to crowdfunding. We chose Kickstarter because it is the most well known crowdfunding website and we figured it must have the biggest userbase. The website is well done, easy to use, and people know and trust it. How long did it take to prepare all the materials and the team before the start of the campaign? It took us a bit more than a month to get everything ready. We are a very small team (only 3 people) so everyone had to work very hard to prepare all that we needed. We were also working on our movie at the same time so it was a very rough month. We checked campaigns that had been successful as reference to see what works and what doesn’t. We had a lot of material ready to be shown since we had already been working on our film for more than a year. Our presentation video was recorded in only 2 days. We also announced on our blog that we would soon start a crowdfunding campaign. How many people did you have running the campaign? What took the most of your time? We were extremely busy during the funding period since we had to take care of the campaign and work on our movie at the same time! Like I said before, there is only three of us so we didn’t have a team taking care exclusively of the Kickstarter. It all happened so fast that it was hard to keep track of everything. Many people were asking questions, leaving comments, some people also offered to work on our project (which we refused for this particular project but we did keep every contact for possible collaborations in the future). Overall, we didn’t have any major problem during the funding period. The only drawback was that answering everyone was very time consuming. When a campaign is over there are always a couple of pledges that get cancelled, usually because some credit cards get blocked for some reason. Contacting the backers that had problems like this can take some time too. Did you experience any difficulty with pledgers after the campaign (sending reward, canceling, etc)? Our movie is not done yet so we haven’t started to send the rewards to our backers. Most of our rewards are digital only so things should go pretty smoothly! What did you do to “kickstart” your project when you launched your campaign? Did you experience any difficulty to promote your project? One thing that really helped our Kickstarter campaign to get off the ground was our fanbase. Back when we first started working on this film, we created a blog (http://legouffre.com/en/) where we posted our progress regularly. Over a year, we managed to get around 300 followers. When our campaign started, these fans backed our project and helped to spread the word. Thanks to them, we reached our goal (that was very low, we only asked for 5000$) in 7 hours. Where did most of your pledgers came from? What did you do to get them involved? Our film was chosen as the “Project of the Day” on Kickstarter. This gave us amazing exposure. We also presented our project on many animation forums. We think the overall vibe of our project (serious and honest, but also light-hearted and funny at times) helped get people involved, even those that didn’t know us before. In the end, most of our backers were either people related to our circle of friends, to the animation industry or people browsing Kickstarter that found us by luck. How did people react after you success on Kickstarter? We really hope that our movie will have an impact on people once they see it, but right now, with only our trailer and our Kickstarter campaign, it’s hard to say if people were affected by our project yet. Many people did give us wonderful comments, praising mostly our art style and animation, so it’s promising! Hopefully people will love the story too once they see the full film. A lot of people were impressed by the “financial” side of our success and wanted to know how we did it. This interview is our most in-depth description of our experience with Kickstarter yet! If you were to do a campaign again, what would you improve? If we ever do another Kickstarter, it would probably be for a way bigger project so we would aim for a higher goal using what we learned this time. For this project, we didn’t plan a lot of “stretch goals”, so when we reached the amount of money we needed, we didn’t have much more to offer to attract new backers. This was probably the weakest part of our campaign, so it’s something we would probably improve next time around. Hopefully our fanbase will keep on growing as people will hear from us or see our film, and that too would be a huge help for future projects. Many artists (especially in Japan) are still hesitating to start a project by themselves because there’s not much of a information on how to run a crowdfunding campaign in the animation field. Can you give us some advice for those artists? We don’t know very well what is the situation of crowdfunding in Japan, but we do know there are absolutely amazing artists in that country. A lot of our favorite animation films come from Japan, and there might be some hint of these influences in our movie. However, investing yourself in a campaign like this is a huge gamble. For us, it was a “last resort” type of move, because we were already all-in with this project from the very beginning when we quit our jobs. We might not have taken such a huge risk if we knew right from the start that it would take two years instead of one to do this and that we would have to rely on crowdfunding, but sometimes you have to be a little crazy and risk it all if you really believe in your dreams! Our naivety ended up being a blessing. Our biggest advice would be to try to have fun! Do a project you love, don’t do it just for the money. You might go through some hard times, but in the end if you truly love what you do, it’ll be worth it and it’ll show in your work. That’s it for this time! 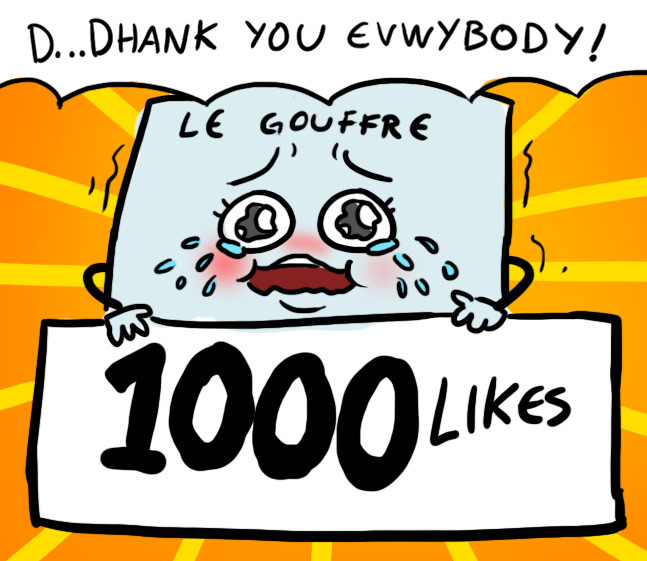 Enjoy the great weather, and come back soon for more news about Le Gouffre!